Pop-up Referencing Url: Prepare your pop-up campaigns to put your information/event/promotion forward. Add key words to better your web your referencing. Plan your pop-up campaign dates in advance and add one or more per mobeesite. Create your qualified contact base using the “contact” button and find out what your clients have to say. Stats : follow and analyse the use of your mobeesites so you can adapt your communication. Design : create your own library of pictograms, buttons and choose the shape of your buttons (rectangular or square or your own shape). Use the Paypal “pay” button. Requires at least a 3G connection, to open a paypal account, and accept their conditions of use. Limited to 1 type of product/service per button. You can create more than 1 “pay” button. Extranet button, drop your documents into your client space so that each client may access it through a private button. Quizz button – create your quizz (begin and end dates – add your rules), create fun “won” and “lost” quizz buttons and draw your winners. Add intelligence and geo-marketing ! 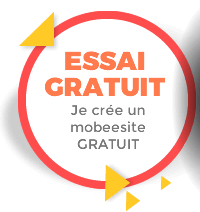 Prepare your mobeesites epr language/store/localisation, place them on the world map. The mobinaut will see the closest mobeesite in their language (that you will have created beforehand). With the stats, see where your mobeesites have been accessed on the map.